DavisDoesDownUnder: Milestone, 666 of Them! 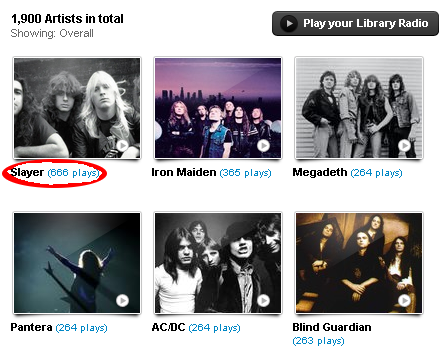 So today I hit 666 scrobbles/hits/plays of Slayer on my last.fm account! This is a really neat number, although not prime, it is the sum of the first 7 primes , and 7 is a prime too. (This also happens to be my 66 post on this blog). EDIT(6Aug2011): Whoops! I made a mistake, 666 is the sum of the first seven prime SQUARES. Not the first seven primes. Sorry!